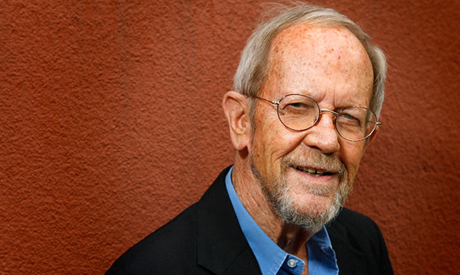 As he struggled writing his forthcoming book, "Blue Dreams," best-selling American author Elmore Leonard thought his 47th novel would probably be his last. Then, inspiration came in the form of a medallion. Leonard won the National Book Foundation's Medal for Distinguished Contribution to American Letters in November, joining such U.S. literary luminaries as Toni Morrison, John Updike, Gore Vidal and Norman Mailer. Now, the award has given Leonard, 87, the vigor and motivation to write at least two more books, he told Reuters in an interview at his home in Bloomfield Village, Michigan, in suburban Detroit. "I don't have any reason to quit," he said. "I still enjoy writing." Leonard is best known for dry, witty dialogue in his crime novels and Westerns, which include 1990's "Get Shorty" and 1996's "Out of Sight" - both of which were adapted into successful and critically acclaimed films. He also served as an executive producer on FX's Emmy-winning TV crime drama "Justified," which is based on Leonard's novels "Pronto," "Riding the Rap" and a short story "Fire in the Hole." After six decades of writing successful stories, novels and screenplays, Leonard now has earned respect in the same breath as America's most heralded writers of his time. "I recognized all the names of the previous winners," Leonard said showing off the award's medallion while puffing on a cigarette. "I was very happy about it. ... The prestige, to me, is worth the most ... It's the biggest." Leonard's crime novels will be published in a multi-volume set by the Library of America in 2014. The publisher keeps important American literature in print permanently. "Blue Dreams," which is scheduled for a 2013 release, is about bull rider Kyle McCoy who is looking for an Indian bull rider who has been unlawfully detained by border police. Along the way, he falls in love with a young movie star. Like the majority of Leonard's novels, the first half of "Blue Dreams" establishes unrelated characters and then Leonard has them interact in the end with unpredictable consequences. Leonard, who is praised for his crisp realism, never sketches a plot for his novels and always writes them longhand on custom-made, unlined yellow writing pads. His daughter Jane types up his books. "The characters come to life and start doing things," Leonard said. "I don't think about the ending until page 300. It's the middle part that's the tough part." Even after 62 years of writing fiction, Leonard says he does not have a favorite character. "I like 'em all," he said. "If one doesn't work, I'll have him shot."